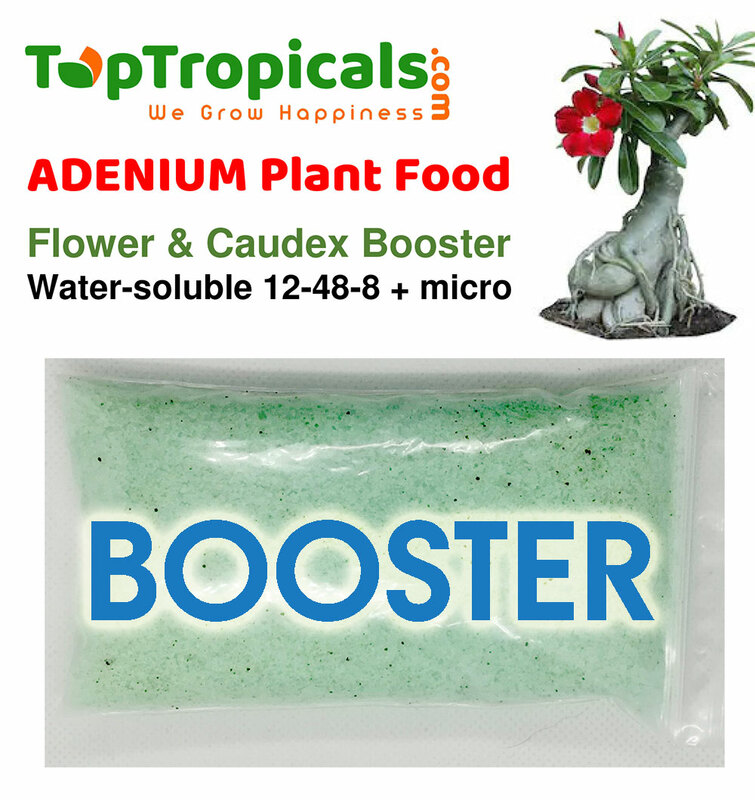 Water-soluble Plant Food with micro-elements specially formulated for Adenium blooms and rapid Caudex growth. 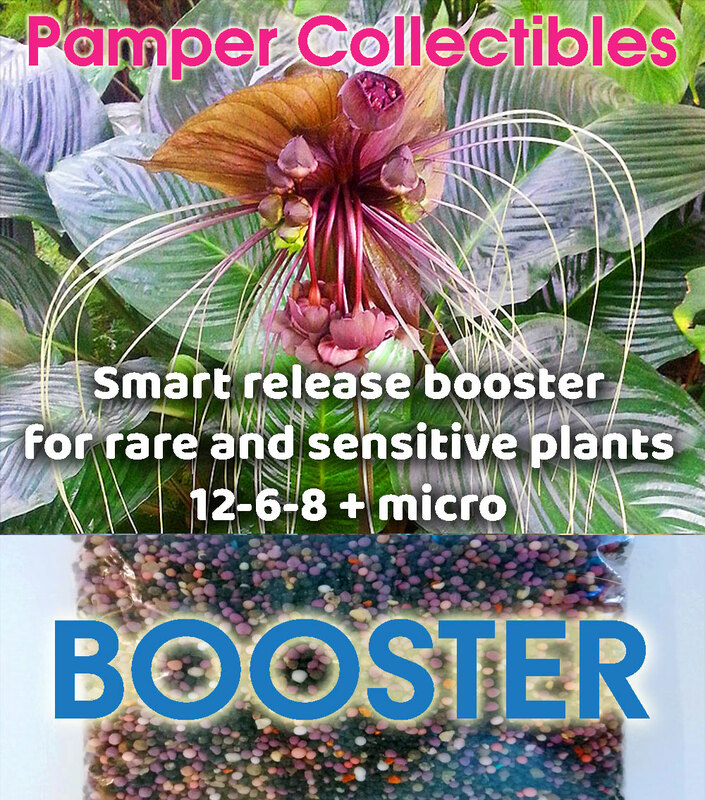 Provides extra water soluble phosphorous to boost flowering and stimulate caudex development. Also excellent whenever there is a need for extra phosphate. DIRECTIONS: Mix 1 teaspoon with 1 gal of water. Spray leaves and drench/saturate the soil around the roots. Do not apply on caudex! Use on leaves and in-ground roots only. Apply once a week during active growth season when night temperatures are above 65F. Hungry Angel Trumpets are heavy feeders! 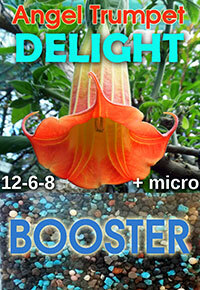 Angel Trumpet Delight is a perfect formula for frequent monthly feed. 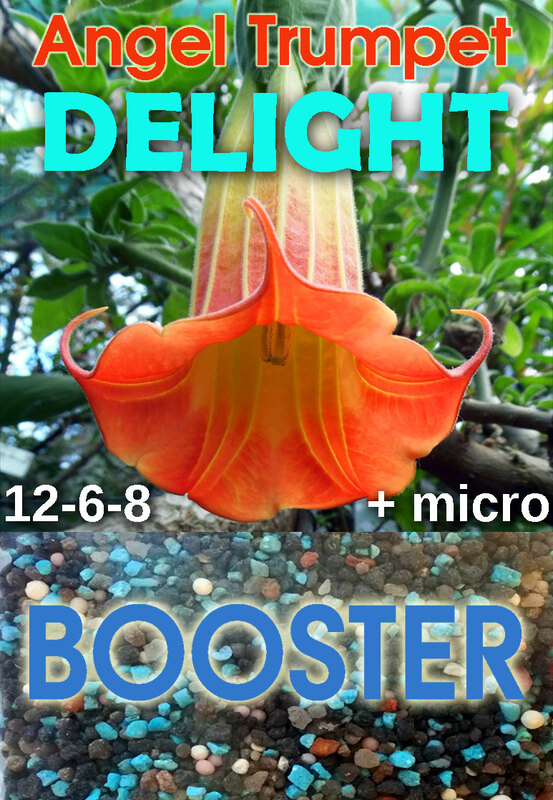 30-day Smart-Release formula works amazing for Brugmansias, Daturas and other fast-growing flowering plants of Nightshade family. A well-balanced combination of macro- and micro- nutrients with a slow release action provides continuous feed, maintains vigor and disease resistance. 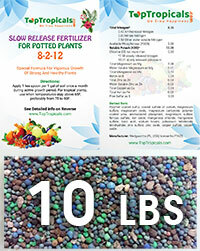 Contains coated nitrogen plus early release nutrients and extra iron (water soluble and chelated) for quick green-up. Manufacturer: Diamond R Fertilizer (FL, USA), license No F5277. 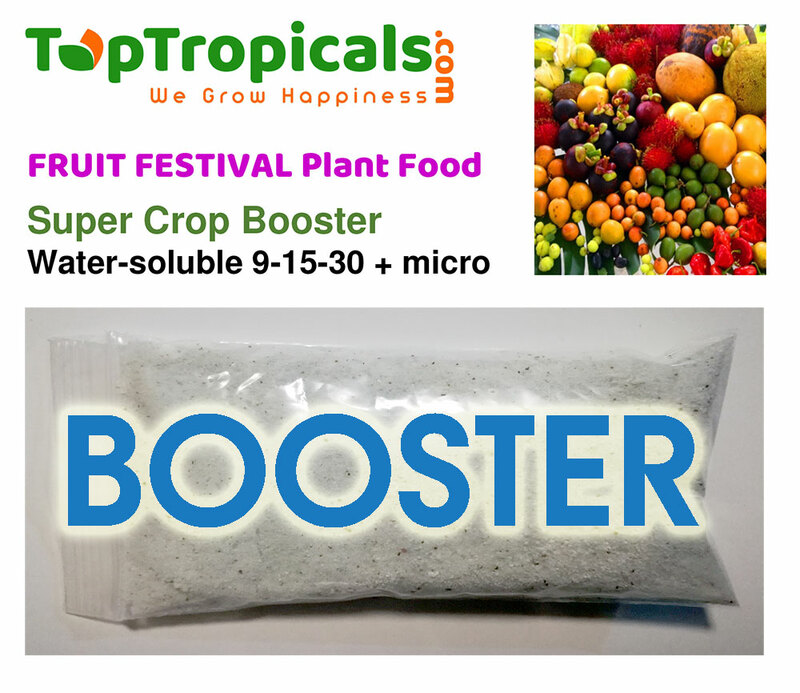 Water-soluble Plant Food with micro-elements for increasing crops in tropical fruit trees. 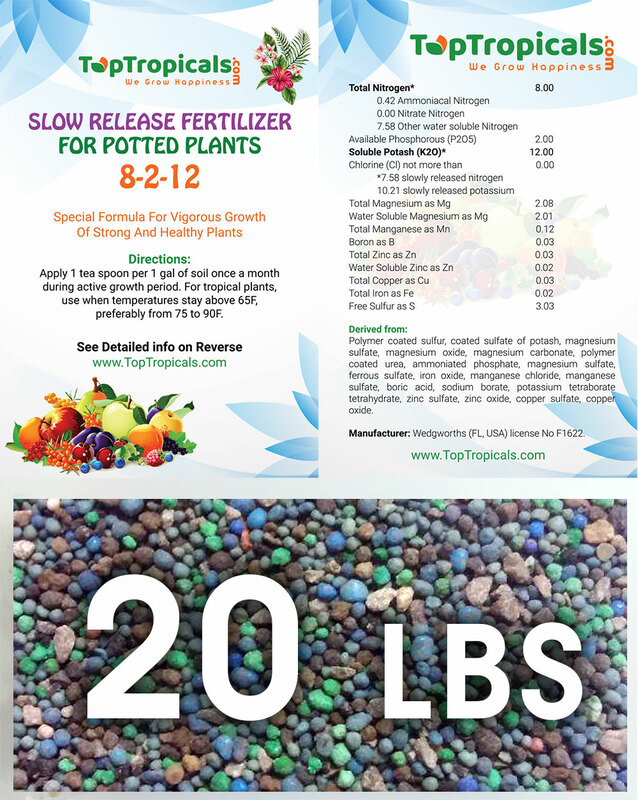 High potash, high analysis formula with elevated nitrate-nitrogen to provide instant feeding to roots and leaves. Supplies three times as much potassium as nitrogen. Ideal blend designed to improve fruit trees health and vigor, and increase crop yield. DIRECTIONS: Mix 1 teaspoon with 1 gal of water. Spray leaves and drench/saturate the soil around the roots. Apply once a week during active growth season when night temperatures are above 65F. 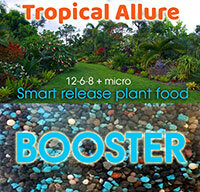 Custom blended smart release fertilizer with a famous 8-3-9 formula. It is formulated especially for establishing Mango trees. It is formulated for hot climates and excellent for all young tropical fruit trees, including Annonas, Avocado, Lychee, Jackfruit, Papaya, Banana, Tropical Cherries and Berries, and Citrus. 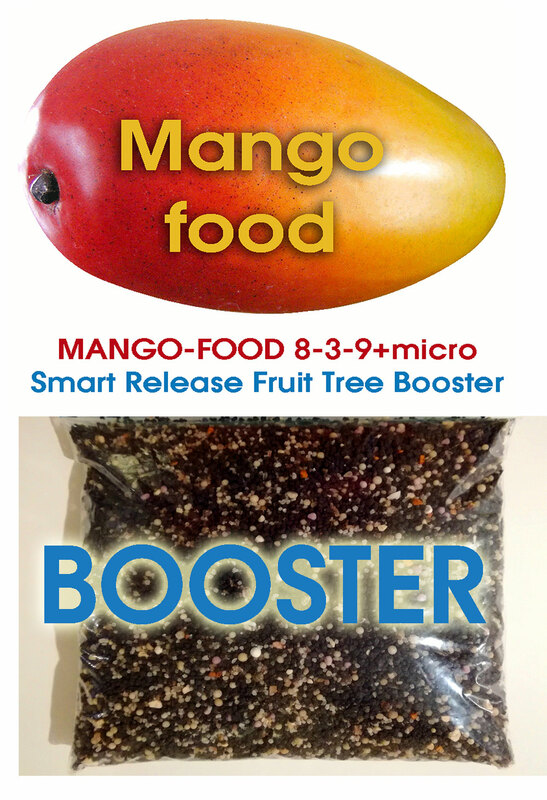 Mango-Food has a perfect NPK ratio for tropical fruit trees in warm climates, especially the ones not fruiting a lot yet, and slow release nitrogen that won't burn the roots. It will ensure your fruit trees have the meaningful elements required for vigorous growth. Precise amounts of macronutrients and micronutrients help produce strong growth, high yield, larger fruit size, and better juice quality. - for young trees not yet fruited, apply 2 tablespoons per 25 square foot of area. - for established trees, apply 1 cup per 25 square foot of area. 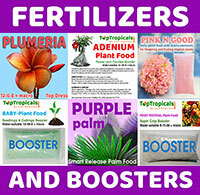 Potted plants: apply 1 teaspoon per each 1 gal of soil. 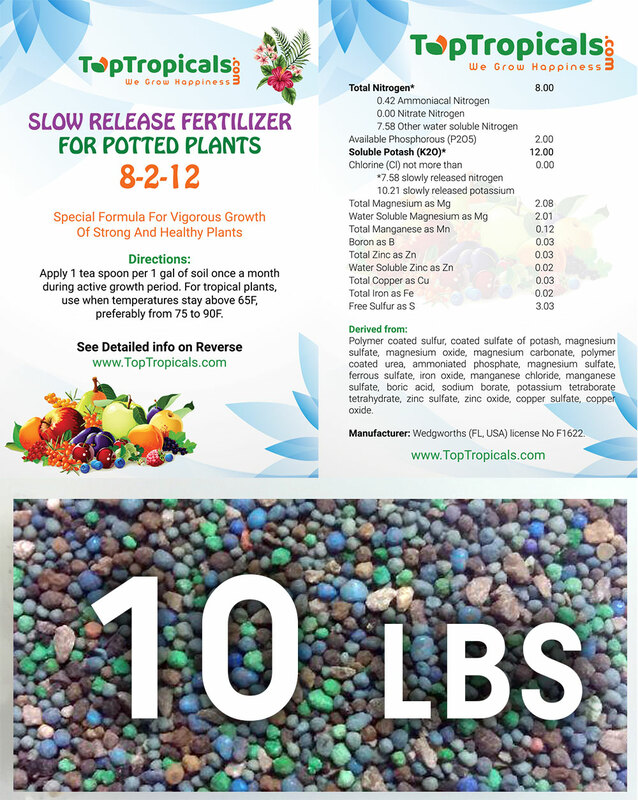 Fertilize once a month during the active growth period when temperatures stay above 65F, preferably from 75 to 90F. Water-soluble Micro-elements: Boron (B) 0.06%, Magnesium (Mg) 2.30%, Sulfur (S) 9.21%, Iron (Fe) 0.32%, Manganese (Mn) 0.10%, Zink (Zn) 0.06%. Manufacturer: Diamond R Fertilizer (FL, USA), license No F1857. 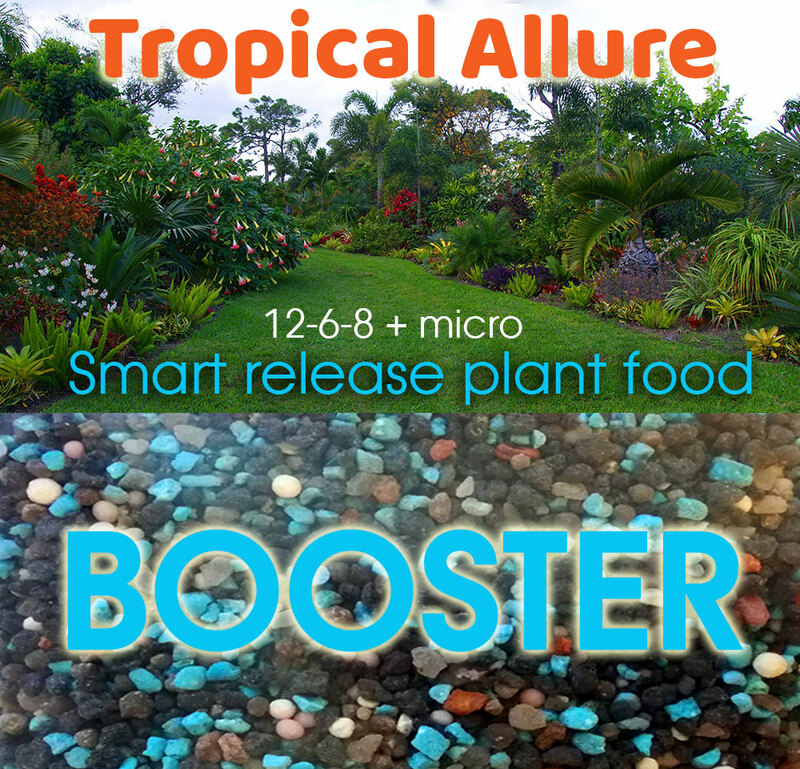 90-day Smart-Release container plant food with a gentle formula created especially for rare, tender and sensitive tropicals. Well-balanced combination of macro- and micro nutrients with a slow release action provides continuous feed, improves vigor and disease resistance. Use it on your rare plant collection of specimens that require special attention for establishing and adapting to new conditions. 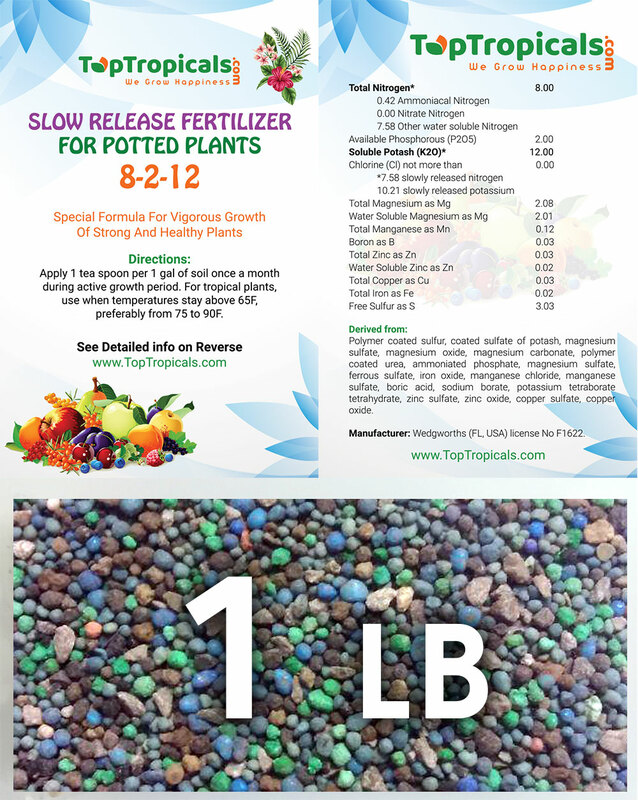 Contains 8% polymer coated nitrogen plus early release nutrients and extra iron (water soluble and chelated) for quick green-up. The high-performance dual reactive layer polymer coating technology is activated by moisture and not affected by media type or pH, it can maintain integrity and last the stated period of release even in climates of extreme heat and rainfall. 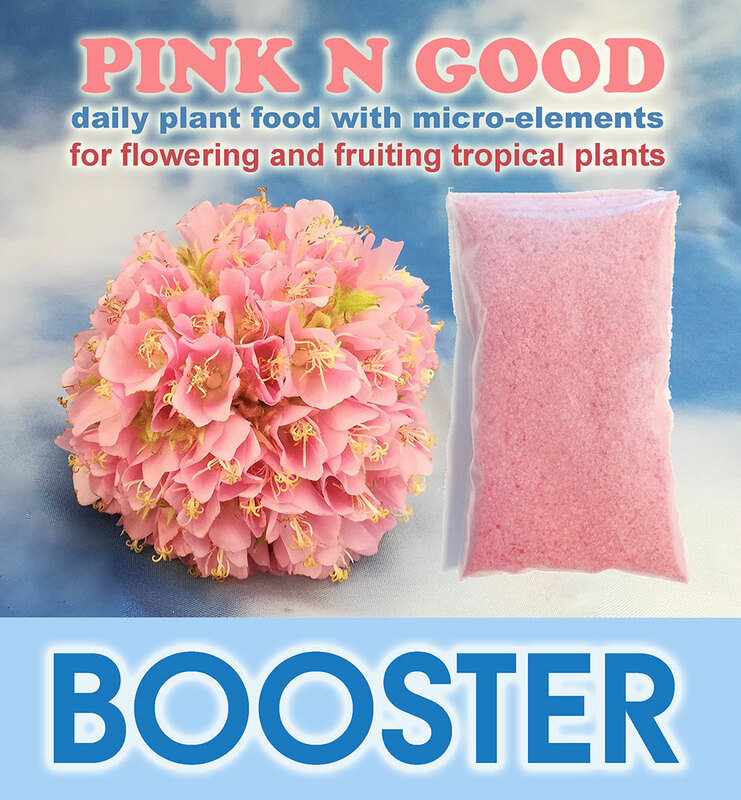 Water-soluble Pink Plant Food with micro-elements for promoting tropical flowering. 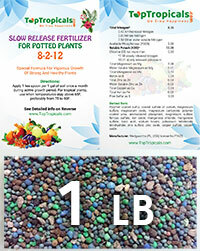 With a revolutionary formulation, this Total Feed Fertilizer is the finest flowering plant food available. With precise Nitrogen, Phosphorous, and Potassium ratio and pH balancing, it also includes micro-nutrients, so vital to plant health and disease resistance. - Effective at very low concentration, it can be used on a daily basis with every watering without a risk of burning the roots! 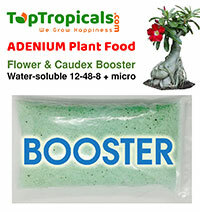 - The perfect treat for potted plants, and tender tropicals. 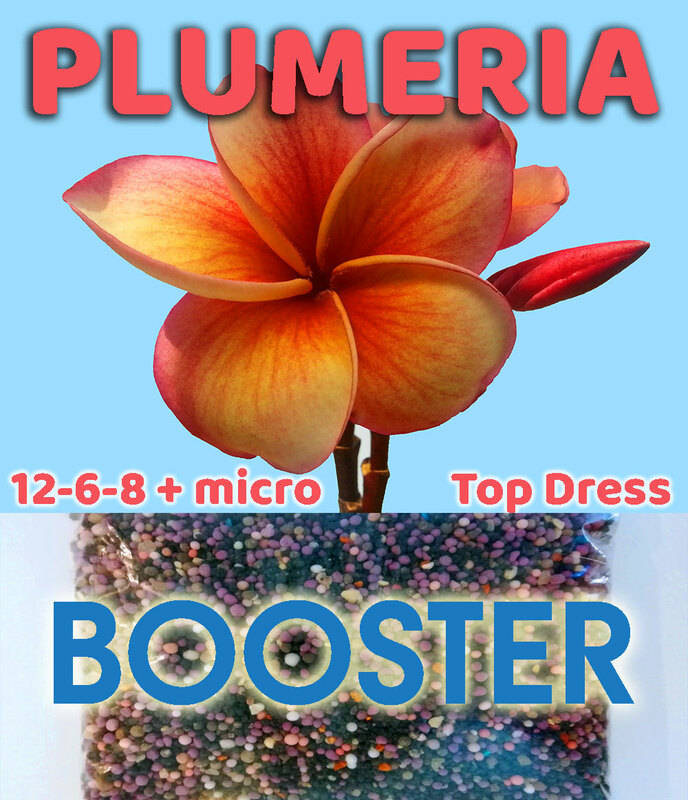 - Great for Pink flowers, Purple flowers, Red flowers, as well as for all other flowers: Blue, Yellow, or White! DIRECTIONS: Mix 1/8 teaspoon per 1 gal of water. 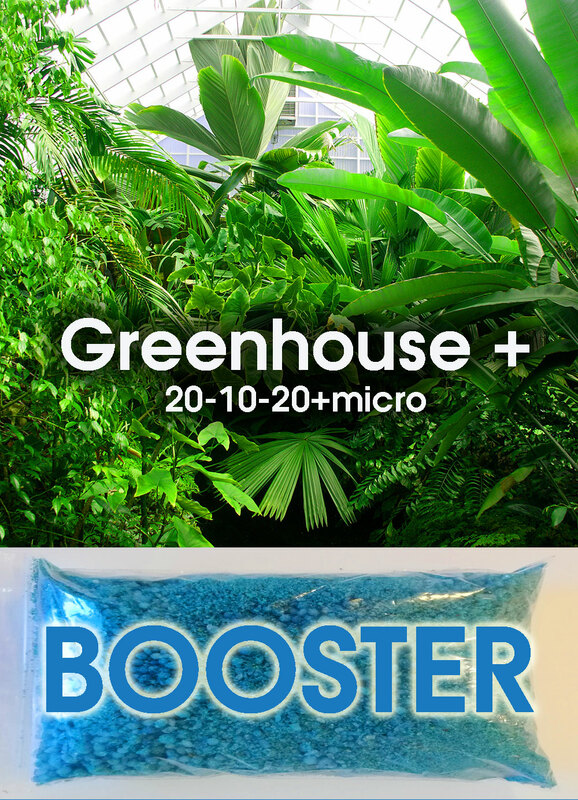 For the best performance in tropical and subtropical plants, apply at least once a week, as often as daily, during the growing season (when night temperature is above 65F). Spray over foliage (foliar spray) and drench the soil around the root ball. 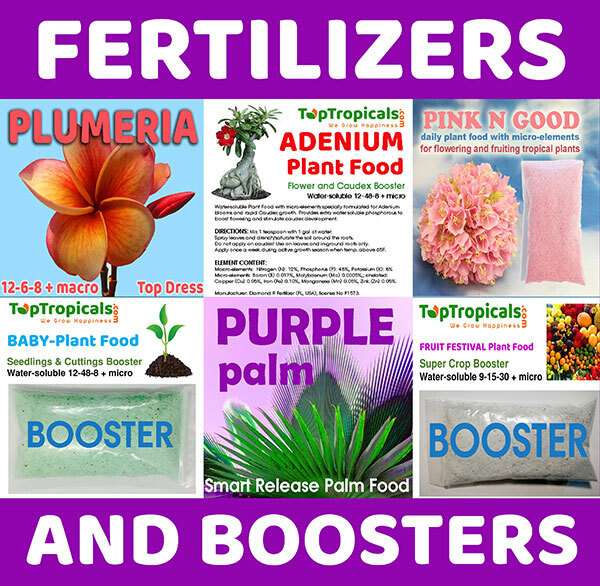 By using low doses when you fertilize, salt build-up and potential plant burning is eliminated. Chelated micro-elements: Copper (Cu) 0.02%, Iron (Fe) 0.10%, Manganese (Mn) 0.05%, Zink (Zn) 0.05%. 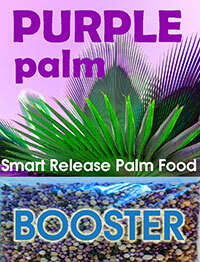 Purple Palm Food won't make your palm purple, but it sure will make it green and healthy! 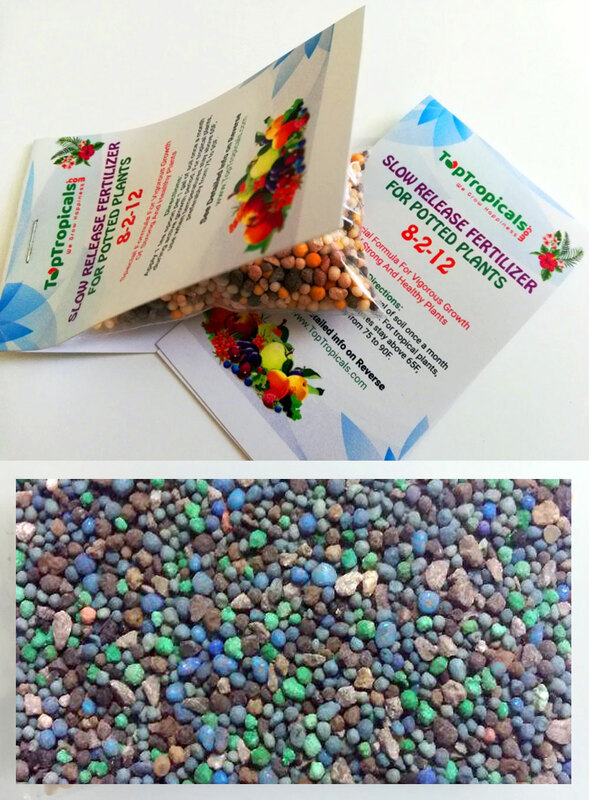 Granulated smart release PURPLE fertilizer, professional custom blend formulated for hot climates and especially for palm trees. This slow-release blend specifically formulated for lasting results. Contains polymer-coated sulfur-coated urea, and polymer-coated sulfur-coated potash. For small potted specimens, apply 1 teaspoon per 1 gal of soil once a month during the active growth period when temperatures stay above 65F, preferably from 75 to 90F. Chelated micro-elements: Copper (Cu) 0.05%, Iron (Fe) 0.03%, Manganese (Mn) 0.99%, Zink (Zn) 0.14%. Powered with Kieserite (a fine-grained white mineral consisting of hydrated magnesium sulfate). Manufacturer: Diamond R Fertilizer (FL, USA), license No F9836. This water-soluble, well-balanced formula is all you need for lush, vigorous and healthy tropical foliage. Use on large leaf tropicals, foliage ornamentals, greenhouse, and traditional house plants. 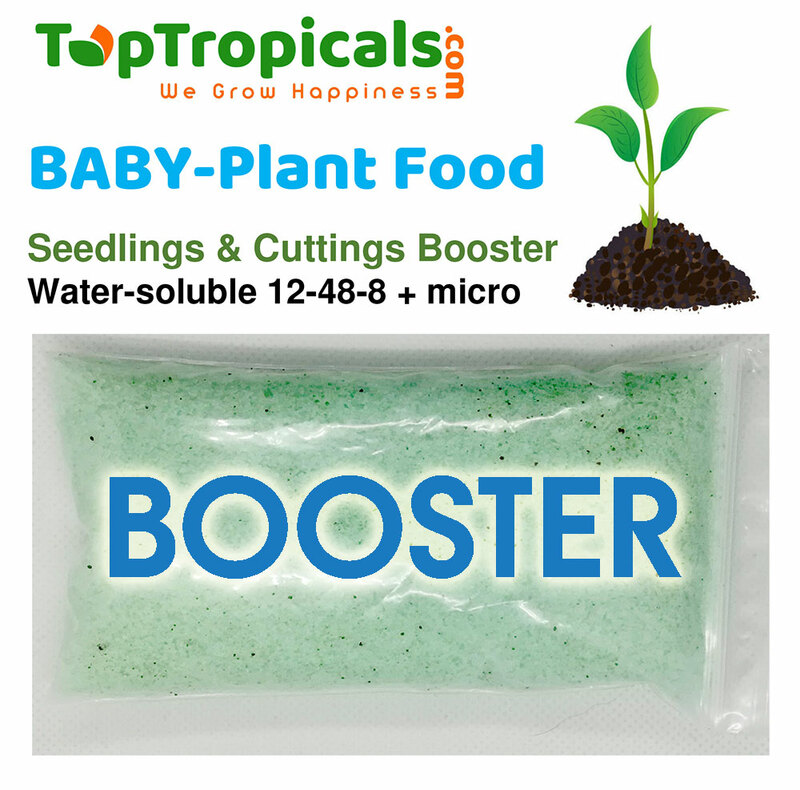 The delicate formula is perfect for tender, sensitive species and young seedlings. Can be also used for a quick build-up of vegetative growth, for establishing and recovering damaged plants that lost many leaves. 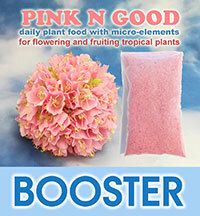 Perfect balanced food for small plants and propagation projects. Urea-free, with a high ratio of nitrate (12.0% Nitrate Nitrogen) to ammonium nitrogen (8.0% Ammoniacal Nitrogen). Chelated micro-elements: Copper (Cu) 0.01%, Iron (Fe) 0.25%, Manganese (Mn) 0.05%, Zink (Zn) 0.05%. 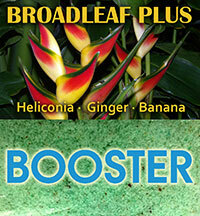 Top Tropicals professional custom blend for fruit trees and ornamental plants grown in containers. 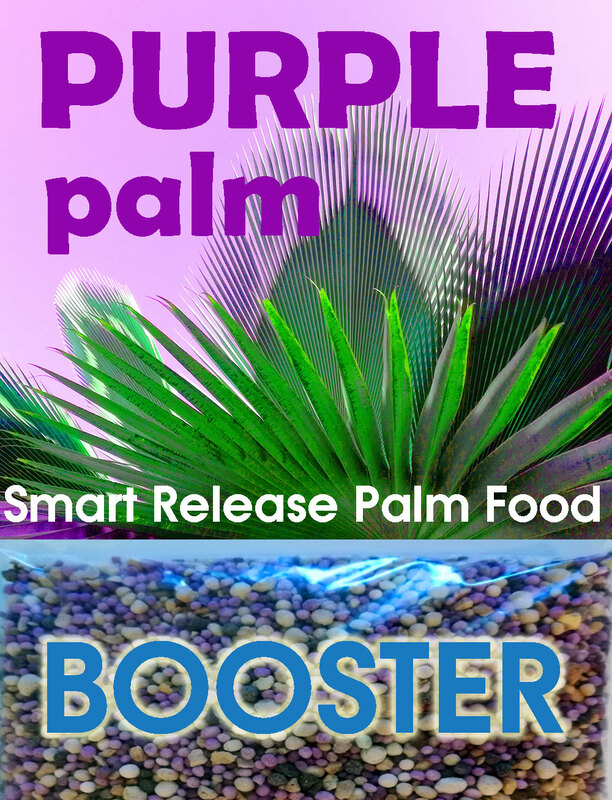 Unique formula of slow release, balanced plant food, containing all major nutrients and micro elements. 8-2-12. See detailed elements content (listed in instructions included). This is not a bloom booster, it is a special formula providing vigorous growth of strong, healthy plants. Manufacturer: Wedgworths (FL, USA), license No F1622. Apply 1 tea spoon per 1 gal of soil once a month during active growth period. For tropical plants, when temperatures stay above 65F, preferably from 75 to 90F. FREE ITEM WITH $200 ORDER! 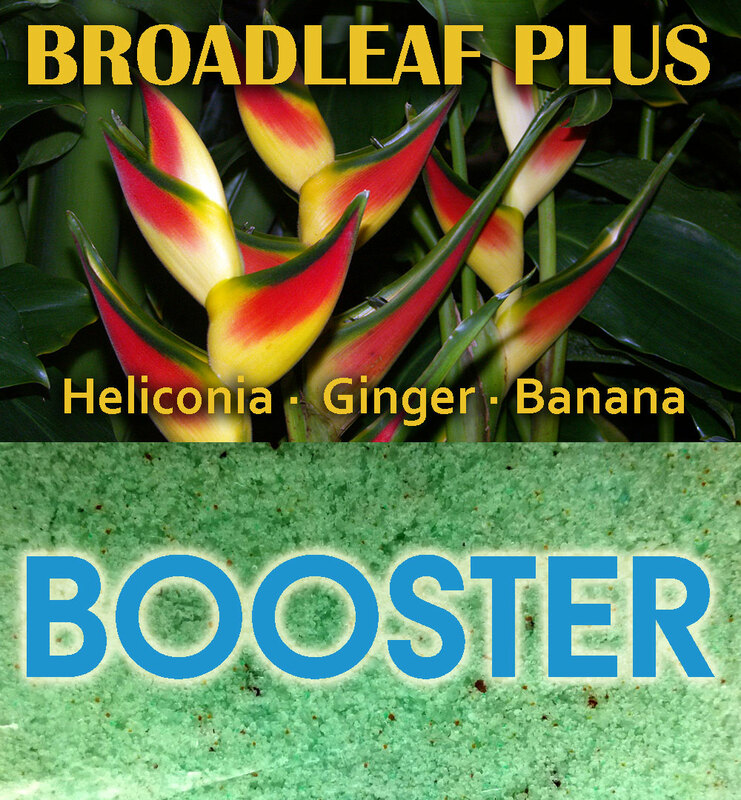 Top Tropicals professional custom blend for fruit trees and ornamental plants grown in containers. 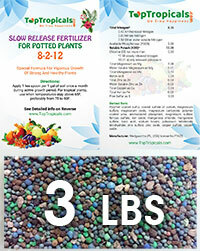 The unique formula of slow release, balanced plant food, containing all major nutrients and micro elements. 8-2-12. See detailed elements content (listed in instructions included). Apply 1 tea spoon per 1 gal of soil once a month during the active growth period. For tropical plants, when temperatures stay above 65F, preferably from 75 to 90F. New product being released in 2018. 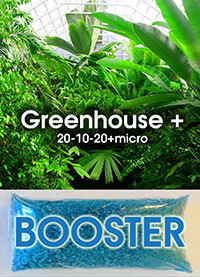 Ultimate microelement supplement for aquarium plants' growing and thriving. Contains: Fe, Mn, Amino-acids. Fish- and shellfish- safe. Convenient dropper-bottle. DIRECTIONS: Add 1 drop per each 2 gal of aquarium volume (or 1 ml per 50 gal) once a week and watch your plant aquarium turn into a beautiful jungle. STORAGE: in a dark place at room temperature. Packaging includes convenient black bag to protect product from bright light. Deficiencies of water plants are often hard to diagnose because damaged leaves look very similar. If there is a lack of some kind of nutrient, plant can transfer this nutrient from older leaves to new leaves to preserve growth. Different nutrients can be transferred inside of the plant in different speed rates. We can divide these nutrients into two groups: mobile and immobile. Slow nutrients are called immobile. These types of nutrients aren't able to get into new leaves in time so deficiencies of these nutrients are shown on new leaves. In contrast, deficiencies of mobile nutrients are shown on older leaves. 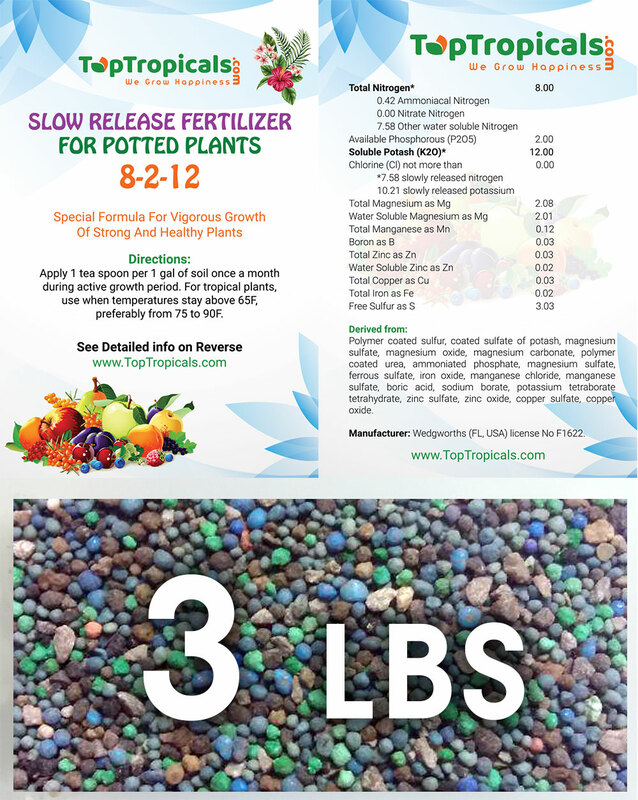 Mobile nutrients: Nitrogen (N), phosphorus (P), potassium (K), magnesium (Mg), molybdenum (Mo). Immobile nutrients: Iron (Fe), calcium (Ca), sulfur (S), boron (B). 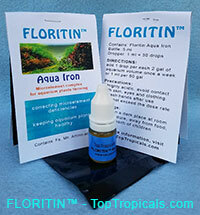 By adding a small amount of FLORITIN Aqua on regular basis, you will eliminate deficiencies in your aquarium plants. Corals in your reef aquarium are friends with algae - that symbiosis requires a special treat for happy thriving. Microelement complex that all marine aquarium enthusiasts have been waiting for - is finally here! DIRECTIONS: Add 1 drop of FLORITIN Reef Iron per each 20 gal of aquarium volume once a week and watch your corals develop much faster. Clogged nozzles in spray bottles? Don't like harsh chemicals? Sprinklers, drippers, injectors, misters, emitters and other irrigation parts can be cleaned and work like new just in minutes! Soak them in Happidox and have a Happy Irrigation like Brand New! 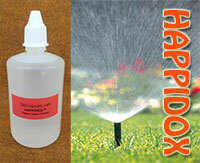 Happidox is naturally derived product that quickly removes calcium and other salts residue. Convenient and very economical dropper-bottle allows you to apply small amounts directly from the bottle to areas with extreme amount of residue and treat the problem right at the spot! DIRECTIONS: For cleaning hard build-ups, use straight solution from the bottle to soak clogged parts of sprayers and irrigation systems. Soak from a few minutes to a few hours depending on level of build up. Rinse with clean water. As preventive measure, when constantly using hard water, soak parts in 50:50 water solution after each use of a sprayers, or every 1-2 months to prevent calcium build up. PRECAUTIONS: Highly acidic, keep away from eyes and protect skin. Product is not toxic and contains natural ingredients including vinegar and citric acids. EXTRA BENEFIT: Based on our experience, Heppidox works great for those stubborn spots in showers, sinks and around faucets. All you need for happy sink look is just a few drops of Happidox and a gentle rub. And its ingredients are completely safe and natural! Smiles for Miles! 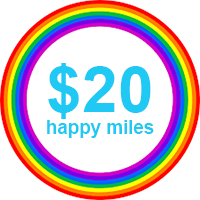 Happy Miles Rewards Program for local customers visiting our Garden Center. Happy Miles = Happy Customer! Ask for this card in our office! It's free and gives you instant 10% off! 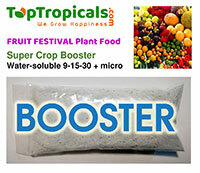 - FREE fertilizer and FREE SUNSHINE booster of your choice, 5 ml bottle. If you prefer to place your order online, select "local pick up" in shopping cart to pick up the order from our Garden Center, you will get your Happy Miles Rewards Card in our office and start saving! - Seeds of Hibiscus Mutabilis - a seed pod with lots of seeds inside. Hurry up while supply lasts! 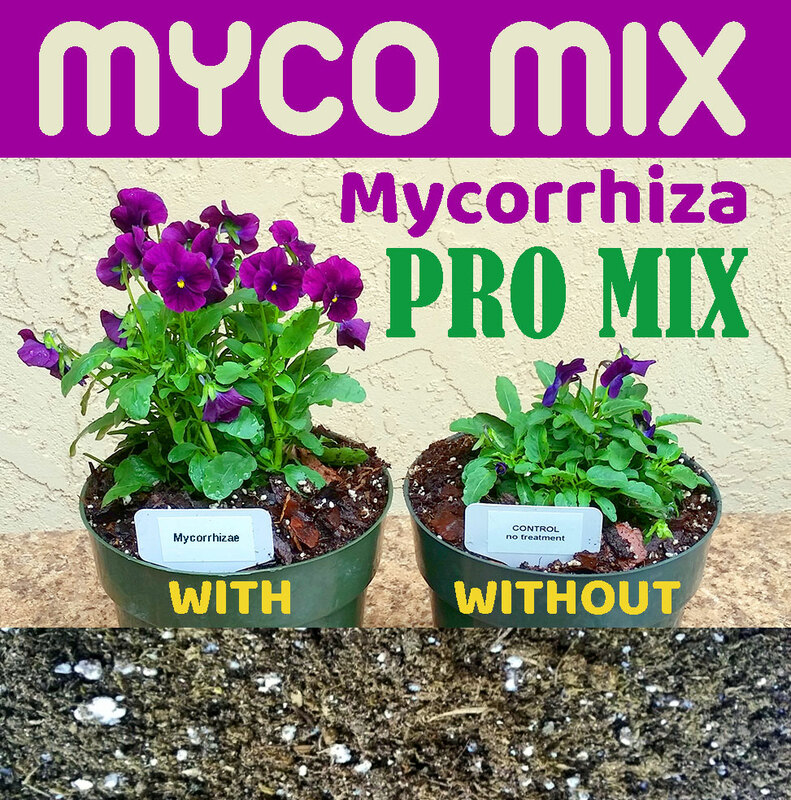 Myco Mix is the amazing underground secret to a better garden! This professional growing medium with Mycorrhiza is a must for establishing plants, recovering weak plants, and for transplanting applications, including seedlings and cuttings. Its active ingredient, Rhizophagus irregularis, is a soil inoculant, or endophyte (microbe) that promotes plant health. A mycorrhiza (from Greek mico - fungus, and rhiza - root) is a symbiotic association between a fungus and a plant. The term mycorrhiza refers to the role of the fungus in the plant's rhizosphere, its root system. Mycorrhizae play important roles in plant nutrition, soil biology, and soil chemistry. These specialized fungi colonize plant roots to create a symbiotic root-and-mycelial network within the surrounding soils, increasing efficiency in nutrient and water absorption to optimize plant performance. Mycorrhizal fungi increase the surface absorbing area of roots as much as 50 times, thereby greatly improving the ability of the plant to access soil resources. They help to solubilize hard-to-capture nutrients, such as organic nitrogen, phosphorus, iron and other tightly bound soil nutrients. Without mycorrhiza, some plants, especially fruit trees, won't develop properly (example: Lychee seedlings never develop into established plants without it). 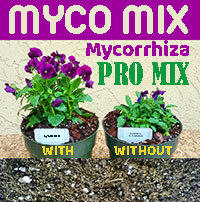 Try the Myco-mix on your difficult growing projects and watch the miracle happen! 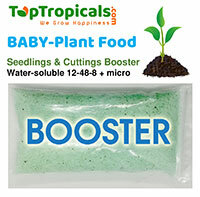 A must for soilles potting mix, provides drainage and holds moisture. 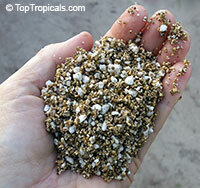 Perlite is a natural mineral; an amorphous volcanic glass with a high water content. Very light-weight and highly absorbent, it possesses an unusual ability to greatly retain water. 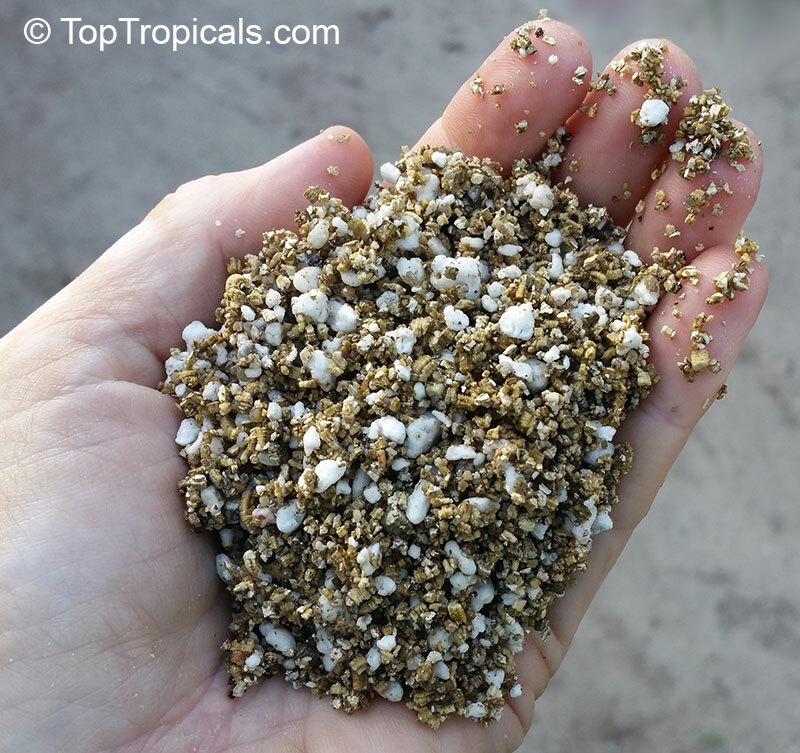 It is used as a great soil conditioner, but not as a soil replacement. Plants need nutrients which occur in the organic content of soil. However, perlite is the best ingredient to improve soil drainage. 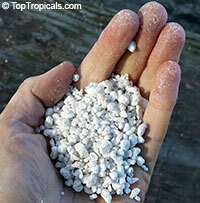 We normally add 10-15% perlite to our soilless mix. Some special drainage-loving plants (like Miracle Fruit) will require a higher content of perlite, up to 40-50%. 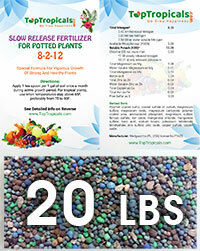 See Info sheet about growing media (2 pages). 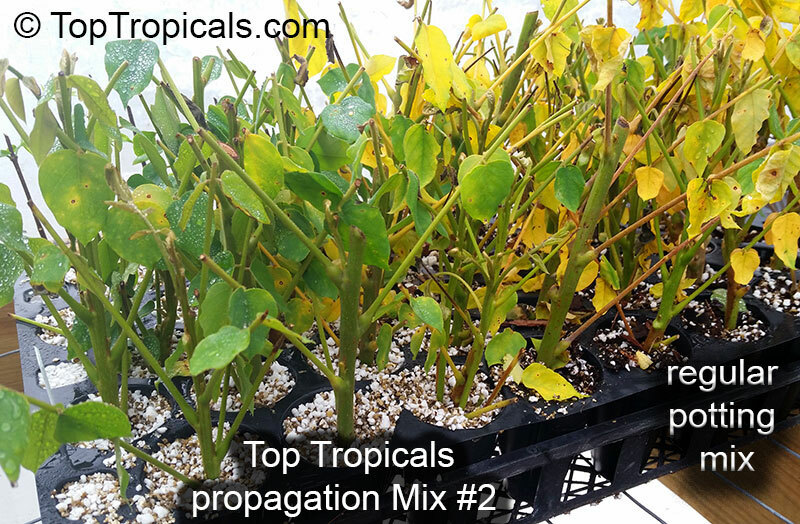 Professional propagation mix for rooting cuttings. It has perfect drainage characteristics, promotes faster root growth and gives quick anchorage to young roots. The mixture helps retain air and moisture, releasing them as the young starter plant requires them. See picture of a tray with cuttings in with propagation mix (left) and regular potting mix (right).